and see the black, green and wine swatches. 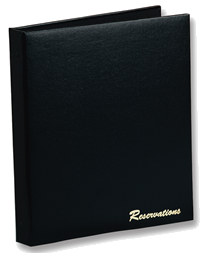 "Reservations" foil stamped in Gold on bottom right corner (only). Sorry! -there's no imprinting option on this model. 8.5" Wide x 11" Tall. Please choose from beautiful Black, Green or Wine finishes. Click the picture to see excellent samples of the material. You'll add your desired quantity after you click "Add to Cart." You can easily return to this page from the Shopping Cart in order to add some Reservations Sheets to your order as well. RES-SHEETS Reservations Sheets for use in the RES-BOOK shown above. If you put a "1" in the quantity field in the Shopping Cart, you will get 50 Sheets. If you put a "3," for example, you will get 150 Sheets, and so on.